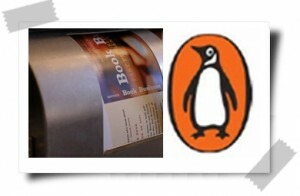 New York, NY (January 17, 2013) – Penguin Group (USA), a leader in adult and children’s trade publishing , has joined On Demand Books’ growing Espresso Book Machine (EBM) program, making its titles available through EBM’s “digital-to-print at retail” sales channel. The EBM is the only digital-to-print at-retail solution on the market today. With the push of a button, a title can be printed with a full-color cover, bound, and trimmed to any standard size. In a matter of minutes, it emerges from the EBM as a bookstore-quality paperback book, which the customer can pay for and walk out the store with right there and then. Content from publishers is fed to the EBM via EspressNet, On Demand Books’ growing digital network of titles (currently numbering over seven million). Much like an iTunes for books, EspressNet retrieves, encrypts, transmits, and catalogues books from a multitude of English and foreign language content providers, including public domain, in-copyright, and self-published titles. Through the SelfServe software, writers can format, design, edit, and upload their books for printing through the EBM, and for inclusion in EspressNet. SelfServe will soon also be able to convert print files to the ePub format suitable for e-readers. The EBM provides a new sales channel for publishers, and vastly increases the availability of titles for physical bookstores, significantly reducing loss of sales due to books being out-of-stock. In addition, the EBM technology offers libraries and bricks-and-mortar retailers the opportunity to become community self-publishing centers, providing a new distribution platform for self-published authors. And of course the EBM improves overall efficiency and environmental sustainability by eliminating shipping and the return and pulping of unwanted books. To read more about this and other related news, please visit On Demand Books. Voltaire Tuvera Gazmin: Under the Shadow of the Flag (written by Edith Magtibay Garde) follows the life of a man who would only reluctantly talk about his life. But this book runs counter to that characteristic humility. It recounts that life only because a group of people insisted on it being told, because there was a story. Read more and order here.